Whether you are running a home or office there is no doubt that it is important to keep the establishment clean. While cleaning of small homes and offices may not be a big problem, we do have problems when we are talking about big factories, commercial spaces, hospitals, schools, colleges, supermarkets and other such places. The challenges are mainly because of the fact that the area to be covered is quite big and the traffic in such places is quite heavy and at times unmanageable. In such crowded situations, finding out the right industrial floor cleaner could be quite tough and there could be quite a few things that must be taken into account. In this article we will try and find out the various things to be kept in mind while going in for such heavy duty cleaners. First and foremost it is very important to understand the size of the area that needs to be cleaned. 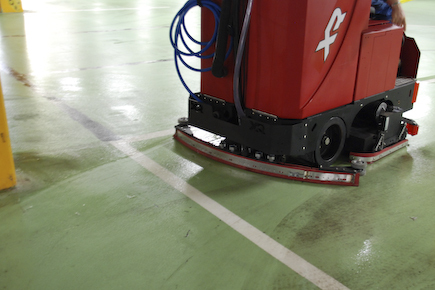 This would decide on the type of industrial floor cleaner that one should be choosing. The bigger the area the bigger the cleaner size should be. However, one thing should be made very clear. There is no place for manual cleaning services in such big places as factories, hospitals, nursing homes, colleges and schools. Even appointing a number of cleaners to do the job manually will not work, especially when the traffic is high. Further many such places would require special chemicals to be used and manually handling them could cause more problems than solutions. Further when it comes to rapid and repeated cleaning automating the entire process is the only way forward. There are many types of floor cleaner choices that one could look out for. For example there could be cleaners that could come in the form of ride-in vehicles. These are generally very useful when the area to be covered is quite big and there is a need for faster coverage using special types of chemicals. Walk-behind floor cleaners are also very much in vogue but they are more suitable for smaller areas and where the traffic is not as high as in hospitals, commercial premises and super market stores. The next important point that should be kept in mind is to always look for floor cleaners that are suitable for various types of surfaces. Today technology has made it possible to have cleaners that can also clean carpets, sofas, furniture, upholsteries, beds and other such soft surface. There are also cleaners that have artificial intelligence and adjust the brushes according to the surface that they clean. Further we should also devise ways and means by which the cost per use is reduced. This can be done either by rationalizing the number of cleaning trips or by buying cleaners that are low on cost but high on performance and efficiency. Hence there is no doubt that while floor cleaners have lot of use the right ones must be chosen. The right process of due diligence must be gone through failing which it would be difficult to choose the right cleaner. Author Bio: Lary Nineham helps other bloggers to find out additional information about floor cleaners which may be interesting for owners of warehouses and offices. Previous : Why Should You Hire Scaffolding And What Are Its Benefits?